Better Ergonomics at the Office: What Products Have You Tried and Loved? We’ve talked before about ergonomics at work — as well as ergonomics for petites — but it’s been a while, so let’s discuss today, ladies! 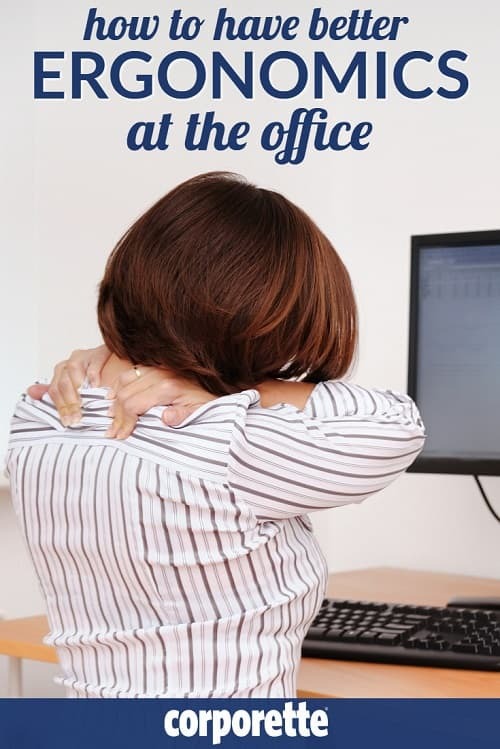 Have you tried to have better ergonomics at the office? What have you bought; what products did you like/not get annoyed by, and what actually made you feel better/good? (Plus, do tell: what did you get reimbursed?) What resources were the most helpful for you in your hunt? I feel guilty saying it’s an “ergonomic” pick but it was recommended by Wirecutter as their “budget” pick — I have the Ikea Markus chair for my main desk chair. It’s ugly as sin but for $200 I’ll take it. I need to get a nice big crate or banker’s box to put under my desk — I’ve tried and discarded a few nicer “stands” and stools over the years and just like the basic banker’s box! Stock photo via Shutterstock / Martin Novak. The Evoluent vertical mouse, along with installation of a keyboard tray to promote ideal typing posture, helped me recover from serious repetitive stress injuries a few years ago. The Evoluent vertical mouse has been AMAZING for me. I had really terrible pain in my right forearm and wrist. The wrist brace helped a little but the vertical mouse was life-changing. I have a FlexiSpot standing desk and love how easy it is to transition from sitting to standing. Have to pull out a squishy mat for standing on too but keeps my back feeling good. I also bought an Anker vertical mouse and it has made my wrist pain go away. I’ll do a plug for ergonomic evaluations. After months of chronic back pain my sister had an ergonomic evaluation of her workspace – paid for by her employer. The difference was dramatic – she felt better within a week. I love my standing desk. I use a Thinkpad keyboard with the red n i p p l e mouse in the middle as my desktop keypad. It’s smaller, and I don’t get the shoulder/elbow issues I had with a regular mouse and being “crooked” on one side. At one point I had a fancy scrollbar mouse/keyboard combo that my firm’s erg consultant gave me, but it was horrible for highlighting text in any way that worked, so it was not functional. Also, I just changed jobs and the monitors at my new firm are so far superior (resolution-wise) to my old one, that it’s made a huge difference for eye strain. Wow. I should have asked for a monitor upgrade sooner. Also, putting in a huge plug for an erg consult. Ask for one. Demand one. They make an enormous difference if your back or shoulders or neck aren’t working. I love my Varidesk and fatigue mat. My employer pays for ergo evaluations done by contractors kept in-house, and from my evaluation I received a sit-stand workstation from JustStand.Org with large screen high-resolution dual monitors (I do a lot of document review and comparison) as well as a cushy floor mat to stand on. I notice a huge difference when I work from home at my regular old desk. My office chair has an old-fashioned mesh lumbar support and I use a split keyboard both at home and in the office. Our office will be transitioning to an open office later this year (the horror!) so I’m trying to convince HR to let me take the Sit-stand home with me to install in my home office. I’m 5’3″ and I’ve been very happy with my Staples Carder Mesh Chair. It raises and lowers to good heights for me in both flats and heels. The seat back offers pretty good lumbar support and adjusts so you can recline more if you like. The seat is shallow enough so my back can touch the back of the chair and my knees sit comfortably in front of the chair, and the seat tilt is adjustable too. It is regularly $199 and frequently goes on sale for even less. My current and former employers both were happy to buy it for me. At my last company, my petite lady co-workers decided to get them too. My shoulders have been hurting from a desk that is too high so I think I am going to ask for an adjustable keyboard tray.